Did you know you could turn milk into plastic? I didn’t. I had no idea! I did know that you can turn cream into butter, which is just what I was planning on doing with my Kindergarteners last week. We love easy science experiments! I looked at her as if she were insane and said, no – this is cream. She then smiled and said, “Oh, I thought it was milk,” and started to walk away. As if you could walk away after a sentence like that! I quickly chased after her and got all the details on how to turn milk into plastic. Turns out – she’s not insane! You really can! And best of all – you only need to add vinegar! Good news friends, I have worked out all the kinks, done this science experiment more than a few times (it’s that awesome), and have all the details just for you. You can turn milk into plastic in literally minutes with only milk and vinegar – and it is awesome. Next, stir in 4 tablespoons of vinegar. Then, strain the milk through a strainer. All the clumps will stay in the strainer and really push on them to get all the liquid out. Finally, transfer it to some paper towels and continue to press all the liquid out of the plastic milk. You can then shape it and colour it if you wish. We used a cookie cutter and then added a few drops of food colouring (sometimes we left it white too). My kids just loved this science experiment, I hope yours will too! So the take away lesson here friends: If someone says something that doesn’t make sense, chase them down the school hallway and ask questions! You might just discover the coolest science experiment of all times. I hope you have a lovely week friends, thank you for reading. Most welcome! Thank you for taking the time to comment … and all the way from Argentina! Wow! 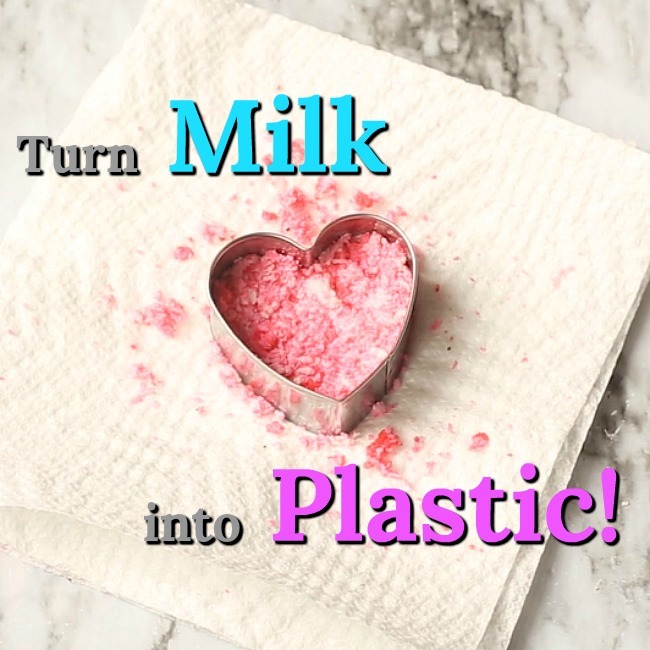 Love it….wow can you imagine all the stuff that goes on in our bodies…plastic out of milk. makes me Think..What else is chemically going on causing serious upsets inside??? Hey….this is not plastic this is called paneer…means cottage cheese. It is very popular in India. This is eatable and very very healthy thing to eat . Is that how you make paneer? I love paneer. I’ll definitely try it. Yes, and we make it a lot using either vinegar or lime juice or citric acid granules. It is delicious and healthy and one can make innumerable things from it!! Also, the water can be used for household plants. It nourishes them! I was going to also comment that this was a simple cheese. I make it at home. The vinegar causes the curds to form and separate from the whey. Thank you, this helps explain my baby’s extreme allergy to milk years ago. I presume stomach acid could cause a reaction much the same. It looks very much like curdled stomach milk. That was just a beginning. I was just thinking that myself.. This is very interesting indeed.. I think my daughter would be interested in trying this experiment though.. I wonder about the pregnant women and what happens to their fetus who crave pickles and ice cream? Pickle juice is made with vinegar and ice cream is made with milk. I tried twice to make the recipe but it did not work. I heated the milk on the stove to just before boiling then added the white vinegar. Also, I used 2% milk. Does that make a difference? Hmmm – it sounds like you did it all correct. Does anyone have any suggestions for Kathleen please? The same with me just now. However, I used a bit old apple vinegar and lactose free and skimmed milk. It showed a bit but more like freckled. I made paneer long time ago with lemon and it worked well. Depends on the fat content of the milk and the amount of vinegar you add. For half litre(3%fat) milk, i would add 20 ml of vinegar to make panner. Hope this will help. I found this description and thought it did a great job explaining why the lower fat milks don’t produce as well. Seems the casein molecule needs fat to start forming. Logic says less fat, less “seeds” to start the process. “How do different amounts of acid (vinegar) affect milk and why? Milk is already slightly acidic, but the quality of milk as an emulsion enables a characteristic curdling reaction when the pH drops further. Usually fat and water don’t mix, but the casein protein chain binds them together. The protein has both water loving and fat loving particles; presented with both water and fat in milk it grabs the fat and clusters together forming globules with fat on the inside and the water loving particles on the outside. Each globule has a negative charge, repelling each other and distributing each other throughout the water content, forming the emulsion. When these globules are broken, curdling takes place. Interesting – thank you for all of this information! You canNOT use ultra pasteurized milk. It has to be milk that you buy in the refrigerated section of the store. You need to use whole milk. The vinegar denatures the enzymes in the milk and separates the solid from the liquid. The milk fat is the solids. So, 2% will not get you very much solids. It needs to be whole milk. Have you tried pressing this in molds and let it dry? If so how did it turn out? Hi there, we pressed it into cookie cutters and removed before it dried. It turned out great! Does the plastic have an unpleasant odor? I just think of how bad sour milk smells! I had wondered that as well, but no odor at all! Great question. Will this work with soured milk? Awesome! Can’t wait to try it with the kiddos. Yay! Have fun – it is really neat! Does it start to smell? Not yet – and ours is more than a month old! How long can you keep it till it starts to go bad? It is not plastic but paneer used in India. And it is not good for health to keep it for so long. It is like if u keep mozzarella or any eatable cheese outside. Before plastic people used this method to make buttons that are possibly still around today! My grandma had the mould presses for all sorts of different shapes! Interesting that’s the same way you make farm cheese. I wounder what the sciance behind it is. Thanks for the post. You’re making curd, acid is a coagulator used in some kinds of cheese (the other being rennet). You’ve separated the protein from the whey, or the plastic from the liquid. If you look up a recipe for the Indian cheese called Paneer, you may be surprised at how remarkably similar the processes are. Fun project! It is really cool! How long the ” plastic” will last and will it become stinky?i will do it with my boy. Hi Jing, I think it is very cool too! The plastic lasts and lasts and hasn’t gotten stinky at all for us yet. I hope you have fun with your son! Does it matter what type of vinegar you use? Hmmm… I used white vinegar – I’m afraid I’m not sure if it matters! Perhaps other readers will have an answer for you. It is not plastic ……. This is how you make cheese , processing milk by adding vinegar is turning to cheese, please don’t call plastic. Yes you can play with that , but will never turn to PLASTIC. Thank you Mrs. Perfect. The kids think it’s plastic and the science is good. fun sucker. Tim, most plastic is made from petroleum. Plastic also does not readily biodegrade (a plastic bottle can take 450 to 1000 years to biodegrade). Some plastics are known to leach chemicals that are suspected of causing cancer or disrupting hormones. I am not sure you are doing your kids any favours in getting them to believe that milk and vinegar make ‘plastic’. Telling your kids that this process is related to cheese making or calling it something else is not going to spoil the fun!! I was going to say that it sounds like you are actually just making a really hard cheese. I agree, I make cheese that way and use for cooking, is much better then store cottage cheese, is fresh and I make when I needed and don’t have chemical in home made cheese!!!!!!!!! Is there a difference in using 2% versus whole milk? Hmmm … I am not sure – but if you do use whole milk please let me know! Sorry but this is a recipy to make kind of cheese very pepulare .. im surprized that many of you dont know that! You can use instead of vinegare lemon joice it will work and very tasty! Yes it is ,2% milk make smaller amount off cheese .The fat in the milk is turning to the cheese after adding the vinegar! Hi from Victoria Australia. This is awesome cant wait to try it but i will make it into an art activity. Oh neat idea – come on back to share what you did please! I’d love to see. That’s basically how you make buttermilk. I might try it with my grandkids. Thanks for sharing. Thanks Ann – I hope you give it a go – it’s really neat! That’s how I make buttermilk for our pancakes, in the mornings. I also use this buttermilk, while baking, in place of milk, buttermilk, and even water. This homemade buttermilk works very well everything I’ve used it for. I’m going to try it with my grandchildren, for Christmas Decorations. Sounds like fun. Would it work using Almond milk? I truly have no idea. My gut instinct would be that it would not, as the reaction occurs because of the proteins and fat in the milk — though I suppose both of those things are present in Almond milk as well … Hmmm … If you give it a try, please let me know! Sorry this is a bit late, (a whole year late!) but using almond milk unfortunately does not work… I just tried it with my little one and we were very disappointed, but we still had fun trying! What kind of milk do you use? 1%, 2% or whole? What is the ratio of mixture. From 1 and 2 % milk you will have smaller amount of cheese! My thoughts are is it more environmentally safe since it originated from milk and vinegar. My teacher is making us to science fair projects and this was perfect! It was super simple and easy. So glad it worked out for you Mac – thanks for letting me know! My daughter and I are trying this right now with 1%. It definitely is not separating like it’s showing in your picture. We are using white vinegar also. We have been stirring for about 5 minutes. May have to get some 2% for this. So with 1%, we added an extra tbsp of vinegar and stirred for about 8 minutes. It works and was a lot of fun. Thanks for sharing this. Thank you for this Laura – glad it worked and you had fun! Thanks so much for sharing. I’m going to try this with some of my students. What kind of vinegar is best to use? White distilled cleaning vinegar? I hope you have fun Cleo – I’m sure your students will love it! We just used basic white vinegar. Thanks for writing! This looks cool. I’m going to use this with my 6 year olds. We are in New Zealand, so could I ask what percentage of fat do your milks have? We have full fat, trim or low fat. Hmmm – I would assume “trim” would be equal to our 2% … I hope your 6 year olds love it! 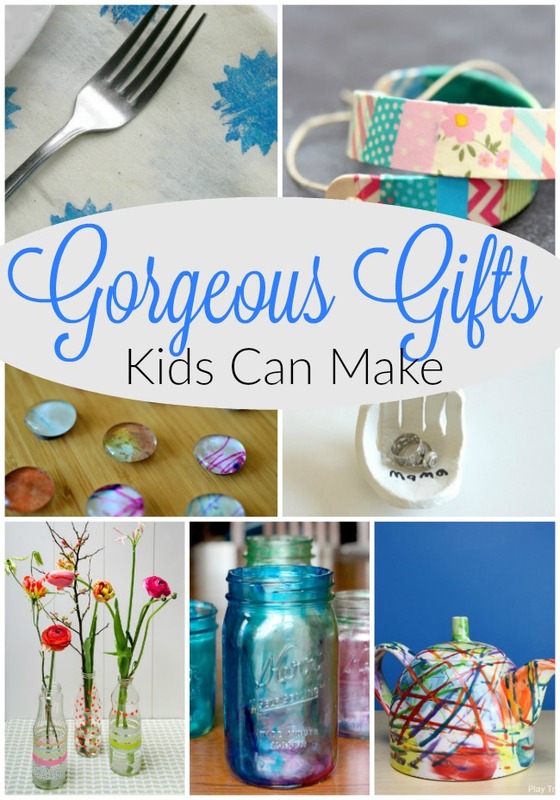 This is great – I’ve been looking for some science / art projects to try with my kiddo. 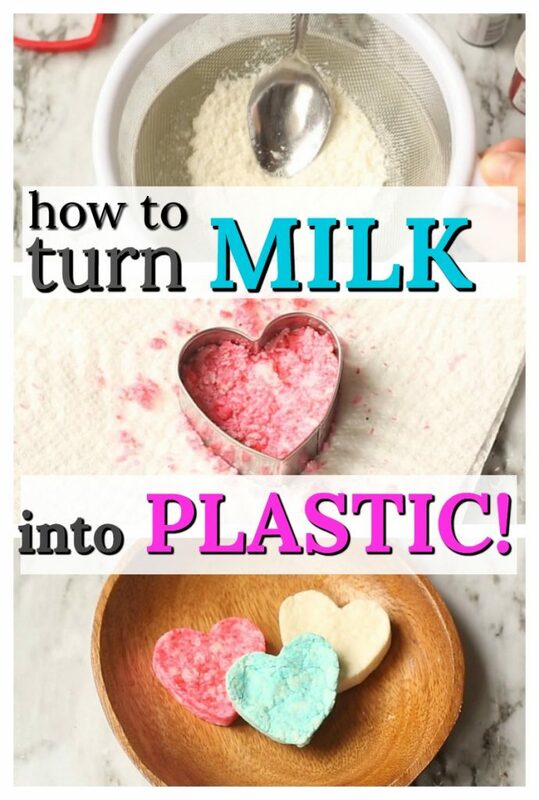 Sorry to be pedantic but a few times you say you’re turning plastic into milk – I saw it on Pinterest and couldn’t work out how on earth that was possible. now I see, you’re not turning plastic into milk, but milk into plastic! We coloured ours at the end, and it did not work so well. I bet adding the colour right at the beginning would give a much smoother appearance – but with science experiments, who knows?! If you try it please pop back with an update. Thank you!! Hmmm – Maybe more vinegar? No odor at all! It’s fascinating! Thank you for post this. 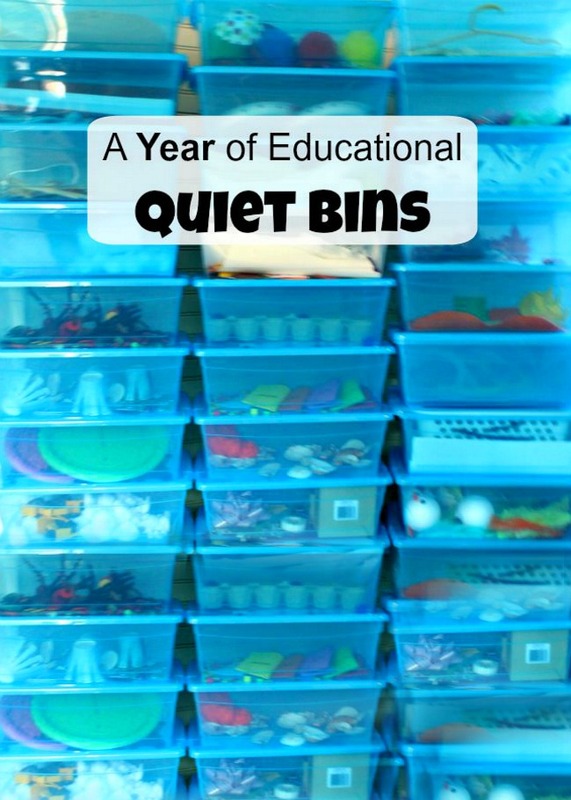 I really like the idea and going to have a try with my preschoolers. I read all the comments as well. If there turned into kind of cheese, can we try it by mouth to see how it taste like? This is beyond the scope of what I know I’m afraid Jackie. I can not say one way or the other as far as tasting it, but the experiment is really neat all the same! You can paint these after they are hard right? Yes you can. That is what we did. You’ve made plexiglass. Dates from pre WW2 and its what air-plane windshields and windows used to be made with. I remember using our soured milk to do this about 75 years ago!! This is great info! I read milk jewelry was a big deal during the Renaissance. This is our afternoon project today. Thank you so much for sharing this! Cool I have some sour milk and a science minded and crafty grand kid. Coming over.tomorrow. How did they get it to go clear making windshields for planes? Ours was very crumbly is this right? or did we do something wrong? It was really hard to mould as not pliable. Hmm … ours isn’t crumbly at all – very wet and pliable. Did you warm the milk? You should squeeze and take out all the whey water out of the milk. Then it becomes easy to mould. It’s extremely soft and smooth like a cookie dough! Before I micro wave it I put a few drops of red food coloring, so It was a solid pink in color. That’s called paneer in India! We make a lot of dishes using it and it’s delicious. You could squeeze in lime or lemon to curdle milk instead of vinegar! You’ll get the same result. And it’s edible when it’s fresh. Actually you are taking the casein out of the milk. If you take the curd and add a small amount of baking soda to neutralize the acid in the vinegar and then add a little water, it makes GLUE!!!! My 8th graders have to glue construction paper into A tube with the glue they made. WHAT?! Well, I certainly know what we are trying tomorrow – very cool! Thank you for sharing! You sound like and awesome teacher . I wish my grand daughter had someone like you as theirs…. What a wonderful compliment Roberta! Thank you so much for spreading your love and kindness – you made my day! Seriously people? This is NOT plastic. This is how cultures that actually have a food culture like India and Italy make cheese! This is how mozzarella is made too! Please don’t call it plastic and tell your kids that – it’s factually incorrect. You’re actually making cheese – please read the science behind this. This is edible when fresh. It may have plastic like properties when dry but it’s not a synthetic plastic. This is another site that explains it a little more in depth. Ok, listen people, we all know it’s not plastic. When you work with children, you have to speak in a context they understand. They also know it’s not ‘real plastic’. I can’t wait to try this at school with my kids and I WILL call the experiment ‘Turning milk into Plastic’, but I will not have explain that real plastic is manufactured in a factory because most people (preschoolers, as well) already know that!! These are just simple and interesting experiments that enable us to teach children about chemical reactions with simple household ingredients! does it matter what kind of milk and vinegar ? Can you put the food coloring in the milk before you put the vinegar in? I haven’t tried it this way Judy, but I fully expect it would work. Are you able to correct your own post? You said you made Milk out of Plastic and that will confuse a lot of people. I just read what you have so far and there are a lot just confused with the milk and vinegar. Imagine if they think they can make milk out of plastic? HA! I saw that you knew about this error back in May 30, 2016 but you haven’t corrected it yet. Are you able to do this? Please do. Thanks! This was in the first part of this page. Just did Sue – thank you! I used apple cider vinegar and whole organic milk. We couldn’t mold it. It came out exactly like ricotta cheese! That is wonderful Ann! Thank you for taking the time to pop back and tell us! This is amazing! Thank you for sharing, we are going to make Mother’s Day hearts and flowers with our Nursery children. Oh what a great idea! Please pop back to let me know how it went – or share a photo on my Facebook Page Thank you so much! Im over 50 and can’t wait to try it! Lol I do wonder if you can use milk that is a day or two older than the expiration date? We tried this tonight and couldn’t get it to work, must have been because we were using 2% milk. I’ll pick up some homogenized on the weekend and give it another try. Oh shucks Pam! Sorry to hear. We used 2% and it worked for us — Did you warm the milk? Too bad our school only uses fat free milk they throw out gallons a day, I’d love to be able to make something out of it. AFter reading the comments I can’t decide if I want to make paneer or ‘plastic’. Both such cool ideas for my preschool class. (Hey…think I’ll do both.) Thanks so much for sharing this. Thank you! Some of these people got all bent out of shape over calling it plastic. I agree with you, when working with children it’s best to put it in kid terms. Sarah, thank you for sharing this “Milk into Plastic “ experiment. I’d never heard of this. Deborah Roll, thanks for the information for turning this into glue! William McCarty…LOVE the history of using this for airplane windshields! Happy Holidays to all & lighten up people! Julie, that’s funny, I was thinking the same. Have you tried either yet? 4 and 3 year old loved making ‘plastic’ now waiting for them to dry to decorate! THANK YOU for our rainy day activity!! YAY!! So glad you had fun Krystena! Thank you for taking the time to let me know! What sort of vinegar did you use for this recipe? Malt vinegar or distilled clear vinegar? Hi Sammie – we used white vinegar. Good luck! We make cheese this way. We also make many desserts using this method. Ex:- rasmalai. If you would like to make a dessert or cheese using this method then use whole milk instead of 2%. I would LOVE to hear more about the edible ideas for this “recipe” if you are able to share. I’d like to try this this week with my preschool “camp” kids. How much milk will I need for about 5 kids to make something and bring it home? I’m going to tie it to the book It Looked Like Spilt Milk. Very cool! I can’t wait to try this! 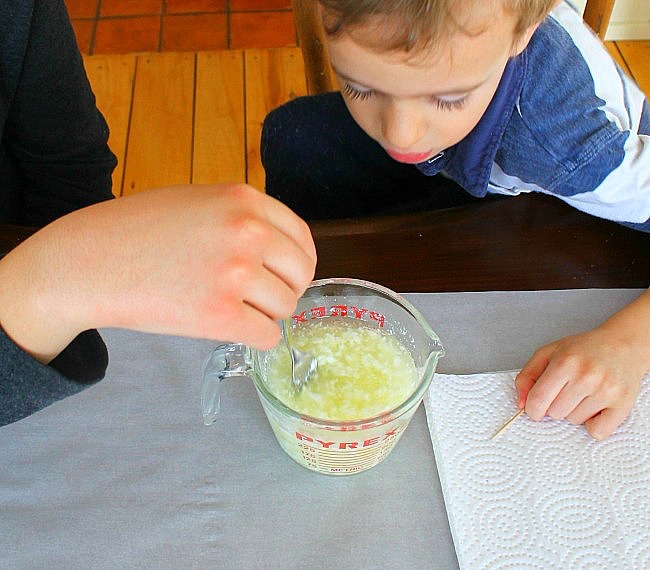 Very nice experiment… teaches kids how to make traditional cottage cheese. Better tasting and flavour you can achieve by adding 1 tbs of sourcream to 1 gallon of room temperate milk, let it sit coveted on the kitchen counter overnight. Warm gently on low heat in the morning and the cheese will separate from whey. Tasty! This is similar to Paneer(Indian cheese recipe, lemon juice use instead of vinegar), please google to know more interesting recipes . Awesome idea and inexpensive as well! Will be trying this at home with my bored 8 year old twins! Thank you! I have just made some with my grandson. We dried it really well but it was very crumbly. We couldn’t get it to stick together. I used semi-skimmed milk but will try with full-fat. I think that might be the answer. I am sure I have heard that people used milk as a glue for broken china when proper glues were not yet available. Looking forward to making this with my class – how many shapes can you create with this recipe? Is it enough for just one child? Hi Rebekah, this batch was enough for two shapes with a bit extra – so I would say enough for two. I hope you have fun! Wow, that’s really interesting. I’ll do it with my class. Seems like a lot of fun too. Thanks for sharing! 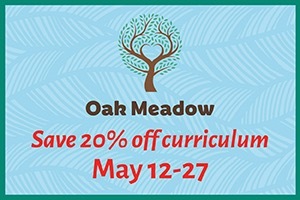 I hope you and your students have fun! Wow, it seems that most people call it cheese making , with variations, but one other to this says it’s actually scientifically the same as plastic. I have not tried this for either purpose, but read all the comments, and think I will give it a try both for the cheese and the artistic medium! Great debate, really enjoyed the read! Lol! This the way my mom makes ricotta cheese!! Hi I’d like to try this, how did you get the hole in the middle after it was done? Hi Sandra, I used a straw to poke the hole when the mixture was still wet. Have fun!! Pseudo plastic made from natural ingredients! Seems to me you have solved the drinking straw dilemma! Straws that biodegrade. *If this has already been asked, please forgive me, I must’ve missed it while reading thru. Could you put the food coloring in the milk before adding the vinegar, instead of after straining? If you are wanting a solid color?